It’s Friday…woohoo!! 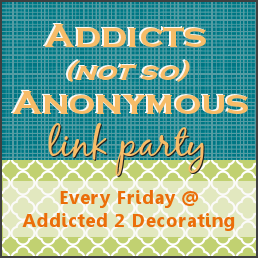 And that means it’s time again for you…my fellow decorating and DIY addicts…to show off what you’ve been working on! Before we get to this week’s party, let’s take a look at some of the fantastic projects from last week’s link party, shall we? Domestic Imperfection showed us this fantastic rocker transformation. This rocker was actually a dumpster rescue! Don’t Disturb This Groove showed us how to turn a spaghetti jar into a pretty birch vase. Simple and pretty…my kind of project! Are you in need of a felt flower pouf? Well, J & J Home has a great tutorial so you can make your own. Check out this bright and fun nursery from Killer B. Design. Love the colors! Ashley from Ashley’s Thrifty Living used a free stencil to transform her bedroom wall into a work of art! Came over to link up and BAM, there's my rocker! Thanks for the feature! you seriously know how to make someone's day, Kristi! Thank you for featuring my vase! You are the best! Having a touch of nature inside the house was also a great idea. Aside from the fact that that it can give a fresh air and decoration as well, it can also add delightful ambiance. There are ALWAYS some gorgeous things on Friday's. wooo hoo and thanks for sharing…..